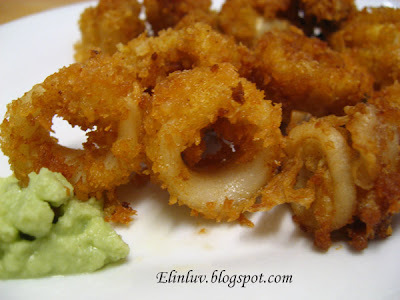 It has been a while since we last had calamari /squids. Daddy loves it deep fried and crispy instead of cooking them in curry . 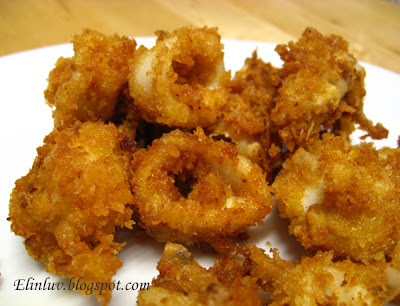 I took out 3 medium size calamari and cut them into rings. I have some panko bread crumbs in the pantry so I decided to have them deep fried with this panko crumbs. I mixed the crumbs with some curry powder so as to give the panko crumbs some spicy flavor. It turned out crispy on the outside and juicy moist on the inside. The taste was awesome...spicy hot ...good match for the calamari. We can't eat much of this artery clogging morsels. Dip it with WASABI.....goodness I can't stop eating them ! 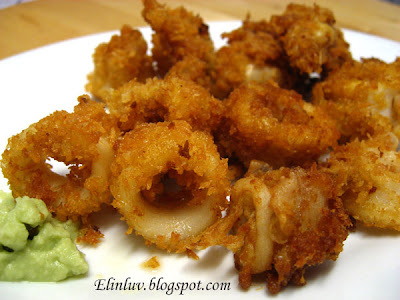 Wash and clean the calamari, cut into ring. Dry them with paper towel. Season the calamari with a pinch of sea salt. Whisk the egg white till fluffy. 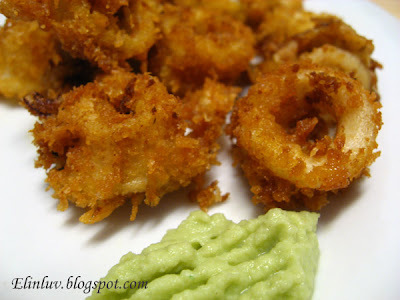 Coat the calamari with egg white and roll them onto the curry flavored panko crumbs. Drop into hot oil and deep fry them till golden brown. Take out and drain on paper towel. Serve with wasabi or chilli sauce. 1. pickled ginger which i just made is awesome! After soaking in vinegar it turns a lovely pick n i love the crunchiness. My vegetable seller advice is to get the Malaysian variety of young ginger (sweeter) rather than the Thai variety. I think a good quality of Jap rice vinegar is impt too. Your fettucine aglio olio recipe is quick to prepare, healthy n yummy! Thumbs up from my family. I added chopped leeks cos leeks is so versatile. Before i dish up the piping hot pasta, some finely chopped garlic will be tossed in. Que Rico!! I love fried calamari!! with glass of cool beer, i'm good to go! My four yr. old just saw me bring your site up and she said, "IS THAT CALAMARI!?!?!" I said, "Yes, Why?" She said, "Wow. You have to make that." There is your review from my picky four yr. old! @ lululu : Me too! Me too!! these look absolutely delicious Elin. Im going to make this next time! tq . I love fried calamari. 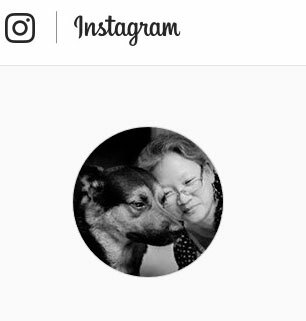 Nice pics!